We’re paintball fanatics that live and breath paintball. Now we’ve set a mission to review and bring to you the ultimate resource for everything paintball. When we ventured out to buy our first paintball gun, we noticed one fundamental problem – lack of information about paintball guns and paintball accessories. There is no shortage in the number of options available online, but the overwhelming number of products got us confused. And when confused, there are high chances you end up buying something which you wouldn’t have otherwise. This is exactly what happened to us. The soles aim here is to cover the different types of guns. You’d understand that having a paintball gun matching your play style is very important, which is why we have covered all the main types of the best paintball guns. Also, not everyone can afford guns on the higher range. Hence, we have made a buyer guide’s for guns under a specific price range. Here are all the buyer guides under this section. 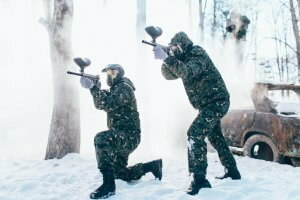 Even though Paintball is a non-lethal sport, it can be dangerous without the right set of paintball gears. This is why we have a section solely dedicated to all the important gears you need to have. We have not only covered the top available options but also given in-depth information about each of the gears in our articles. Here we will have articles on all the do’s and don’t to keep your paintball guns and gears in shape. Also, a few tips so that you can ace your next paintball game. Pick any article here, we are sure it will guide you in the right direction.